Last month, Mission Local reported that some merchants on Mission and 24th streets had not noticed a difference in SFPD’s foot patrol presence and engagement since the department announced it would quadruple foot patrols in September. Shortly after the article was published, the Mission Station hosted a meetup on 24th Street aimed at introducing merchants and community members to the officers. So we caught up with the foot beat officers assigned to 24th Street — Officers Robert Clendenen and Paul Lujano — to find out who they are and how they like walking one of the neighborhood’s most interesting corridors. Officer Clendenen joined the department four years ago. The former paramedic started his field training in the Bayview, and later moved on to Central Station where he walked the Fisherman’s Wharf foot beat. After spending several months at Park Station, Clendenen requested an assignment in the Mission. “I feel like this (the Mission) is a great place to grow and learn as a police officer,” he said. Clendenen said he was not sure the community would embrace him at first, but he feels like it has. But being a foot-beat officer isn’t always easy, he said. Often, his car is parked far away from where he’s patrolling on foot. If he needs to respond to an emergency, he’s not always the first to get there. Clendenen did say, however, that being a foot-beat officer has its advantages. “Being here on foot, I’m more embedded in the streets — I can smell things better, hear things better, and I can see things up close and personal,” he said. Officer Lujano came to the department in 2014 after serving military tours in Afghanistan and Iraq. He, too, trained in the Bayview and later moved to Tenderloin Station to finish his probationary training period. He was eventually assigned to the Mission. “The smells of the streets are pretty awesome,” he said when asked what he liked most about working on 24th Street. 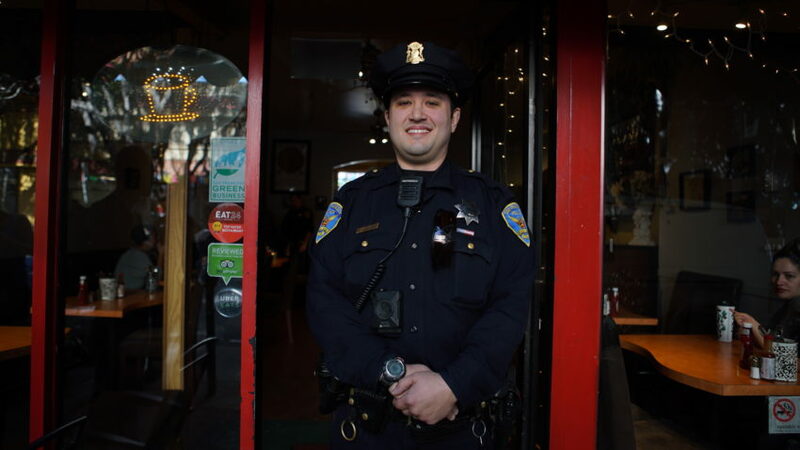 Lujano has noticed that the Mission Police District — which includes the Mission, Noe Valley and Castro neighborhoods — is a very diverse place, and calls for service can vary from neighborhood to neighborhood. “If you chop the Mission District up, you’ll have three or four different identifiable cultures and communities within the district itself, and that provides unique call volume,” he said. The Meet-up was at L’s Caffe’, a great local business!